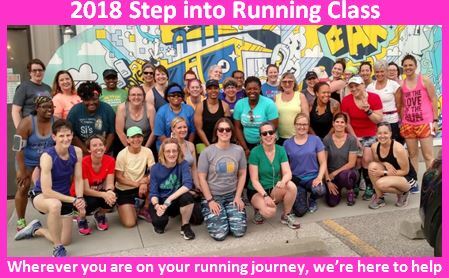 Step into Running is an 11-week group training program for women and girls sponsored by the Omaha Running Club. The program targets beginners, those looking for group support or those wanting to get back into running after time away. Group support and encouragement during the training help participants increase their fitness levels and prepare for the Go Girl Run 5K on Labor Day. Weekly evening training sessions are held every Tuesday, beginning, June 11, 2019 at Peak Performance, 519 N 78th St, Omaha, NE Time: 6:00 PM. Training sessions last 40-60 minutes, comprised of a warm up walk, 30 minutes training, cool down walk and stretching. $ 5 for ORC members who have renewed or began their 2019 membership before May 10, 2019. Online registration is open. Just click the get me registered button above. Pre-registration is required and payment is due at the first training session on June 11th. Payment will not be taken during the online registration process. Registration fee can be made by cash, check or credit card on June 11. Please arrive at least 10 minutes early to make your payment. Payments are nonrefundable and nontransferable. Attend 9 of the 11 sessions and you'll earn a t-shirt.. Questions? Email us at stepintorunning@hotmail.com.